Objects Of Affection: Read the Interview and Enter the Giveaway! Read the Interview and Enter the Giveaway! WOWEEE...I was on the FRONT page! Now Accepting Credit / Debit Cards! Put on your bow tie and dance! About a week ago, I had a gal by the name of Samy contact me on etsy about doing an interview and giveaway on her blog. 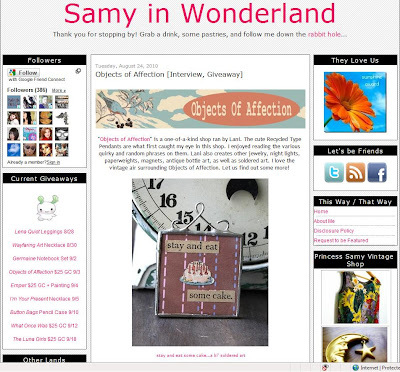 After checking out her blog, Samy in Wonderland, and seeing what a wonderful place it was I really wanted to do it. She has many great interviews and some wonderful giveaways, you really should check it out and become a follower! Samy also has an etsy shop, Princess Samy Vintage, full of great vintage goodies. To read the interview and enter the giveaway go here.